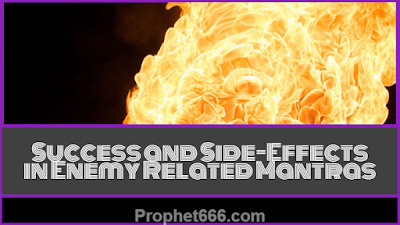 In this post, I have written about the basic ingredients that are needed for destroying, removing, harassing enemies or taking revenge upon them by resorting to paranormal means. These requirements might appear to be most simple and basic but without them it will be very difficult to successfully resolve enemy related problems by using Mantra or Yantras or Tone, Totke and Upay. This site gets a large number of queries from readers that are related to problems, dangers and harassment caused by enemies and how to resolve these problems by practicing Uchatan, Videshan, Stambhan and Maran Mantras or Yantras or Remedies. Most of these people wish to know if they can finish, remove or take revenge upon their enemies by resorting to the numerous Mantra Sadhanas and Prayogs published on this site and what are the side effects of practicing these fearsome Mantra and Yantra Experiments. 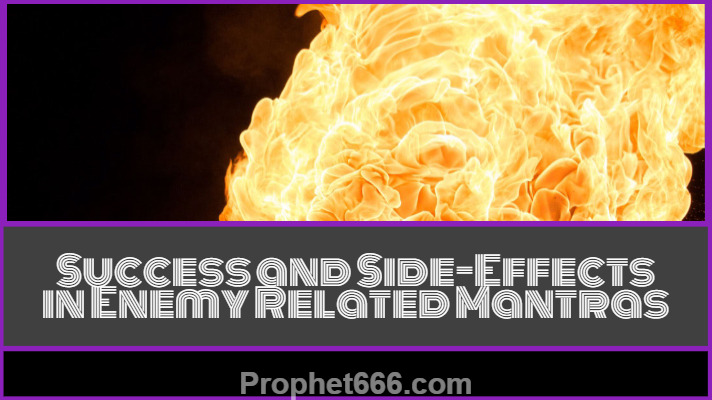 Some important points are given below to understand the basic requirements for success and the side-effects of practicing Enemy Removal or Annihilation Mantra and Yantra Remedies. 1. First be sure about the kind of damage that you want to inflict upon your enemies. This mean whether you want to simply throw the enemy out of your life or make a group of enemies fight with each other or simply shut down the mouth and actions of the enemy or kill and destroy the enemy. 2. Your Bhavana or Feelings are most important as these Mantras, Yantras or Remedies essentially involve harnessing or generating energy and then transferring it in the direction of the enemies for the intended purpose. The Bhavana of the Sadhak should match the kind of Mantra Prayog, which is being practiced by him. If for example you are practicing a Maran Mantra Prayog with the feeling that the enemy should simply go away from your life or his action should be stopped, then, it will be very difficult for you to be successful in the Maran Prayog. In other words the damage that you will be able to inflict upon your enemy will primarily depend upon the intensity of the hatred you feel for him. Hence, as mentioned in Point Number 1, the Sadhak has to select the specific kind of Sadhana, which matches his feelings. Simply, mechanically practicing the Mantra Prayog without feeling and intensity will not yield the expected results. 3. Many people often ask about the side-effects of these Mantra Sadhanas. This again depends upon the kind of Sadhana that you are practicing and whether it is proportionate to the harm or problems caused by the enemy. For example, you do not hang a petty thief for stealing something. 4. The intensity of hatred felt by you for the enemy will surely punish him but it will also adversely start affecting your health. People who practice Satvik Mantra Sadhanas and Prayogs that are intended only for self-preservation or protection of the self, property or loved ones are most unlikely to experience the side-effects of these Sadhanas. Some Tamas Guni and Aghori Mantra Experiments will give side-effects, if there is a mis-match in crime and punishment. 5. Siddha Sadhaks will rarely experience side-effects, provided they remain humble and stay grounded. A common thing that I have noticed in many Sadhaks of the Aghor Panth is that they have bloated egos, such Sadhaks will be taught a lesson by Nature. Some of the most advanced of these Sadhaks even equate themselves with God. If one has clearly understood the symbolism of the Baglamukhi Manifestation of the Divine Mother, then, it would be easy for the Sadhak to know that no matter powerful one becomes in Jaran Maran Vidya, there is always someone who is more powerful than him and the all these Vidyas originate from the Baglamukhi Manifestation of the Divine Mother. The Goddess pulled out the tongue of Madanasura, the Demon King who had gained the power of making anything he uttered come true before destroying him. "Astrolok" is starting a new batch of "Astro Mani- 6 Months vedic astrology course" from 16th Nov. 2018. शत्रु के लिए सबसे अमोघ अस्त्र 'वश्य कर्म 'है ,यानी शत्रु को वशीकरण द्वारा अपने अनुकूल कर लो .यदि ऐसा न करना चाहें तो शत्रु के मित्रों में या परिवार के सदस्यों में विद्वेषण करादें .यह भी न करना चाहें तो उच्चाटन और स्तम्भन का सहारा लें ..जिस साधना के प्रभाव से शत्रु की मृत्यु हो जाय,उसे मारणकर्म कहा जाता है .स्पष्ट रूप से यह ह्त्या की श्रेणी में आता है ,अतः यह साधना वर्जित और निन्दित कही जाती है .तंत्र शास्त्र में इसका निषेध किया गया है .इसका प्रयोग तभी करना चाहिए ,जब शत्रु से स्वयं को या परिवार को प्राणघातक संकट हो और करो या मरो की स्थिति आ जाय .इसके लिए भी गुरु की सहायता अनिवार्य बताई गई है .